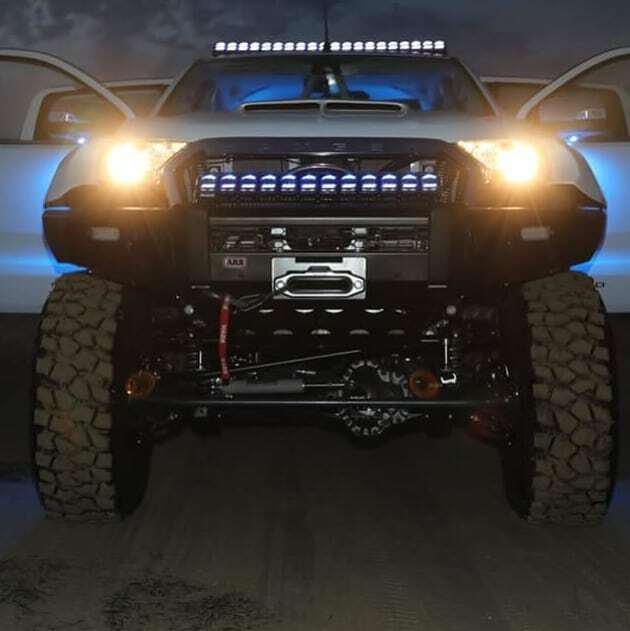 This insane new Ford Ranger lifted on offroad wheels is completely rebuilt and modified by Manuel Garner, Johnny Garner, and Mike James out of DirtCinema. 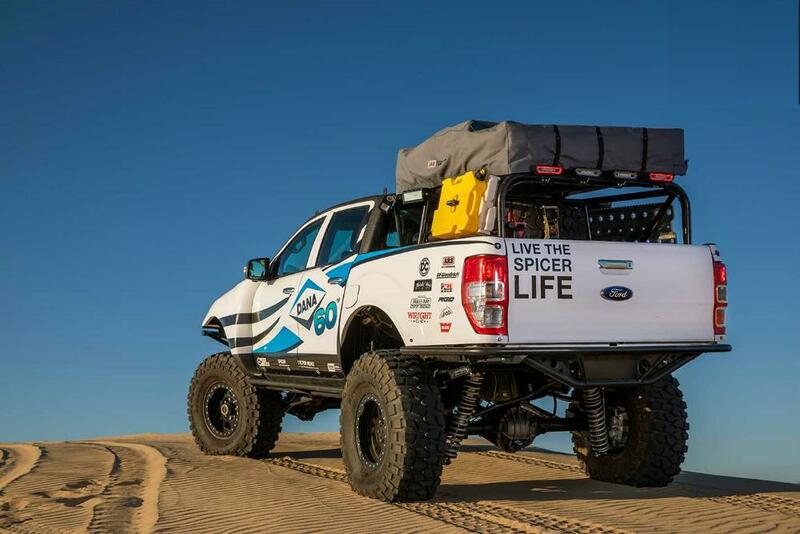 It’s a right-hand drive South African/Australian edition put together for Dana/Spicerparts and Ford, and made its debut at the 2018 SEMA show. 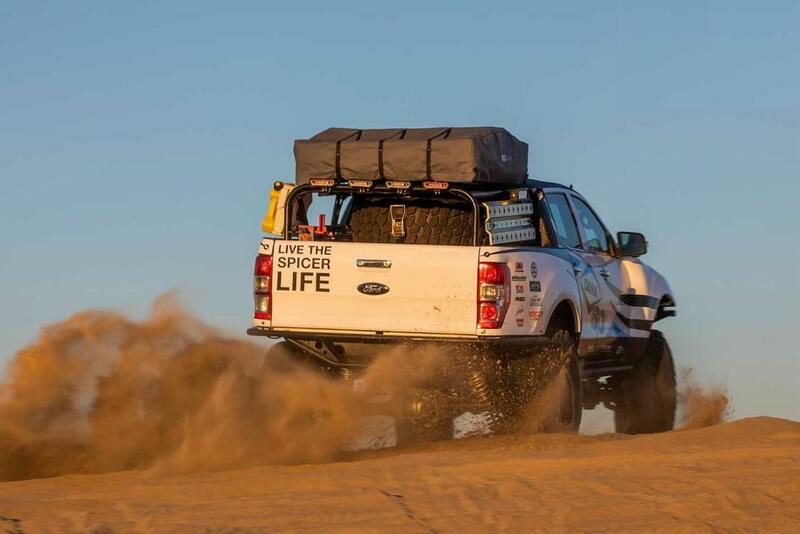 The builders had guidelines to build the ultimate desert rig capable at anything starting from rock crawling to prerunning and Overlanding. 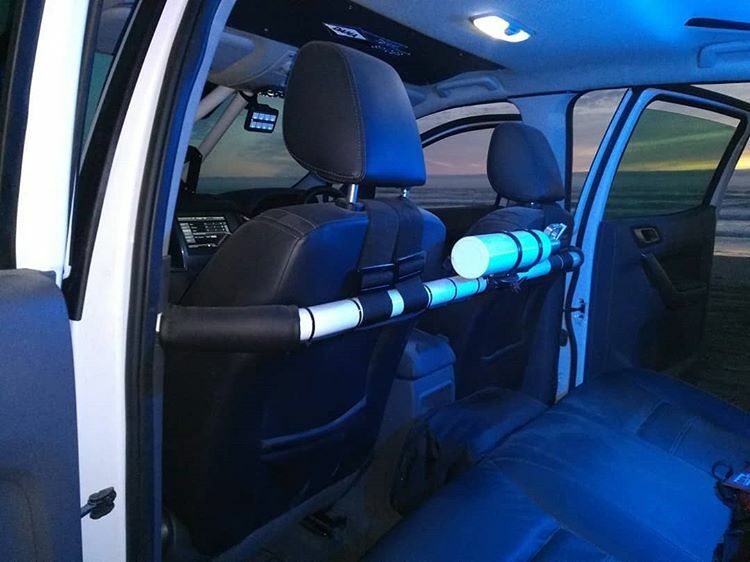 Since there are not many aftermarket solutions available for this model at the moment, they had to fabricate a lot of new components to achieve their goal. 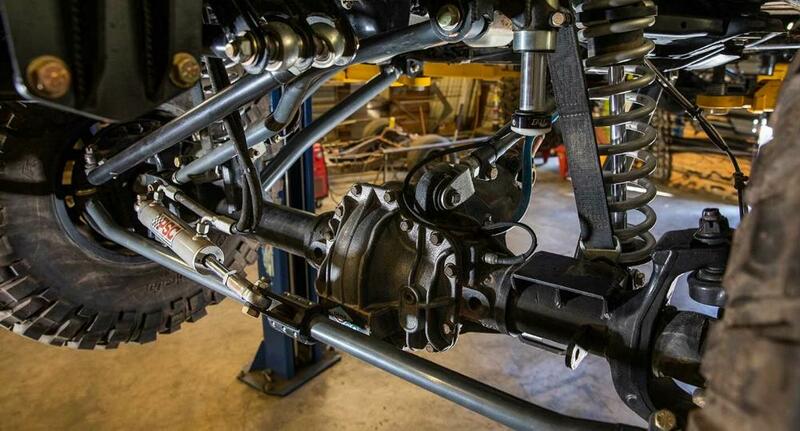 The beefy disc-brake Ultimate Dana 60 rear end is held in place with a custom 4-link and Panhard bar arrangement. 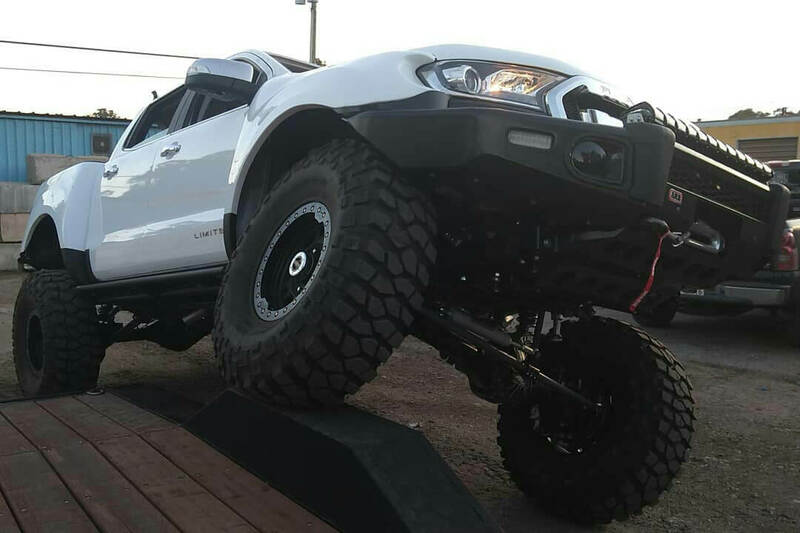 Fully adjustable at both ends, it works in conjunction with huge 2.5-inch body, 14-inch travel Fox coilover shocks to hold the Ranger’s rear end in the air and give it insane amounts of articulation. They’re kept reigned in by a huge torsion bar-style Antirock Sway Bar from Currie Enterprises. Up front there’s a matching Ultimate Dana 60 stuffed full of ARB Air Locker and held in place with a second set of 12-inch-travel 2.5-inch body Fox coilovers. 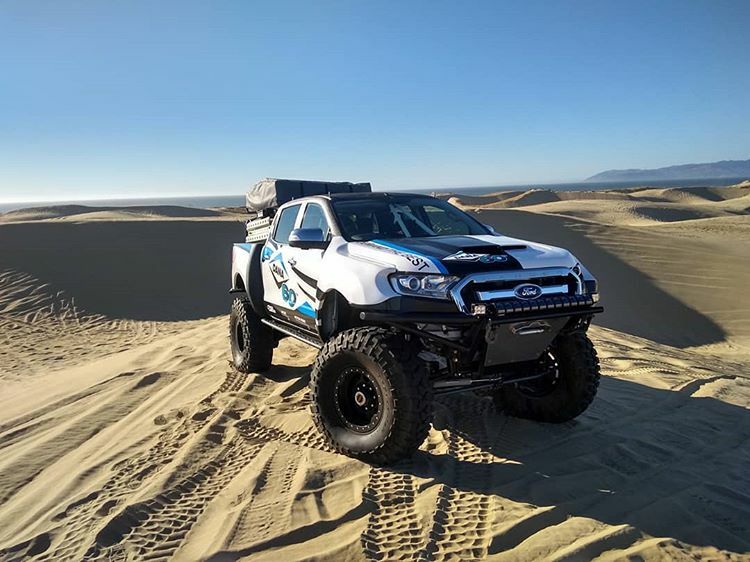 A set of limit straps stop the big-dollar shocks from overextending, while Fox 2.0-inch hydraulic bump stops help smooth out hard hits in those Pismo dune runs. The factory electric steering rack was discarded for a hydraulic PSC steering box leading down to a cross-over steering arrangement. 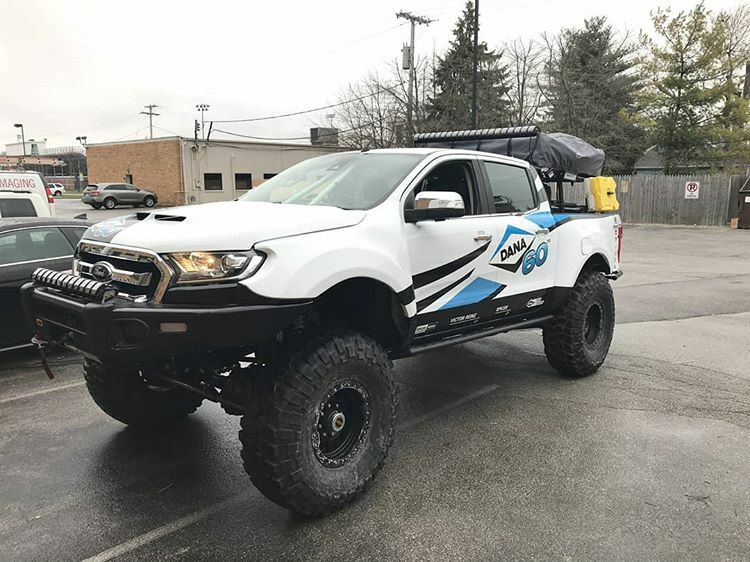 A PSC hydraulic ram was added to the tie-rod as an hydraulic assist setup, helping muscle the big tires around the rocks with minimal effort; the extra volume and an additional steering cooler help keep oil temps in check. 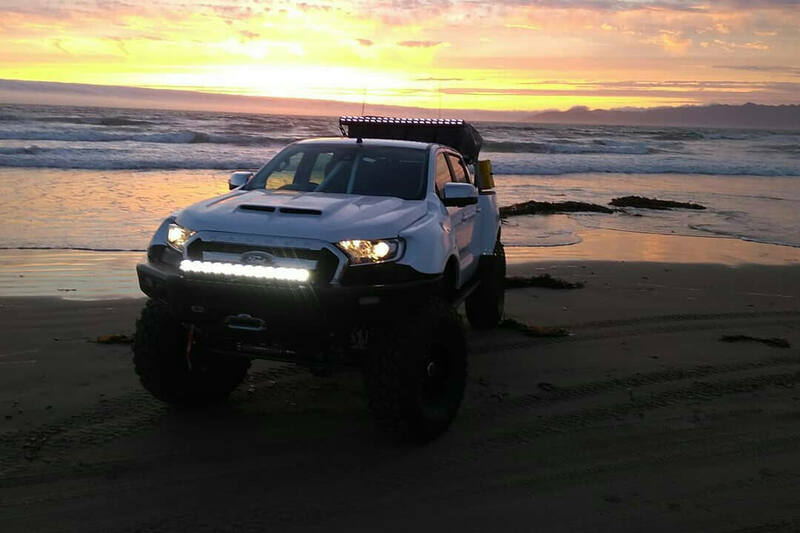 The extensive modifications make room for 39-inch BFGoodrich Krawlers on 17-inch 103 Xtreme alloys from Ultra Wheel. Additional room for the tires comes from custom fiberglass fenders. 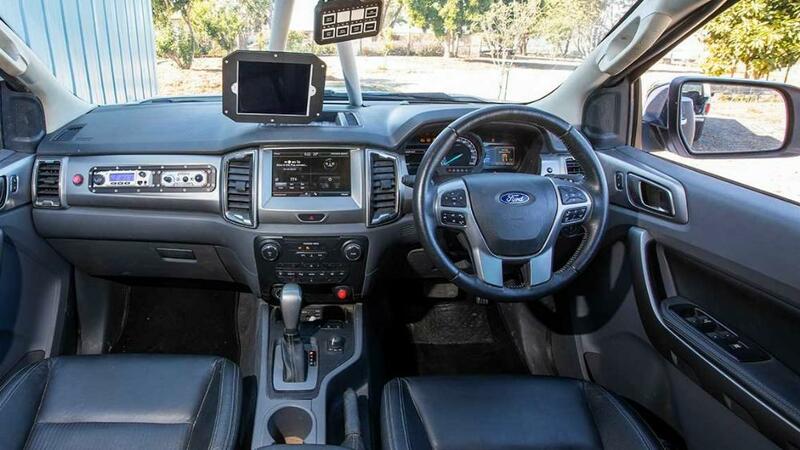 Up front a pre-runner-style bar sets the new width of the Ranger a full 14 inches wider than stock, that’s seven inches wider again than the new Ranger Raptor. 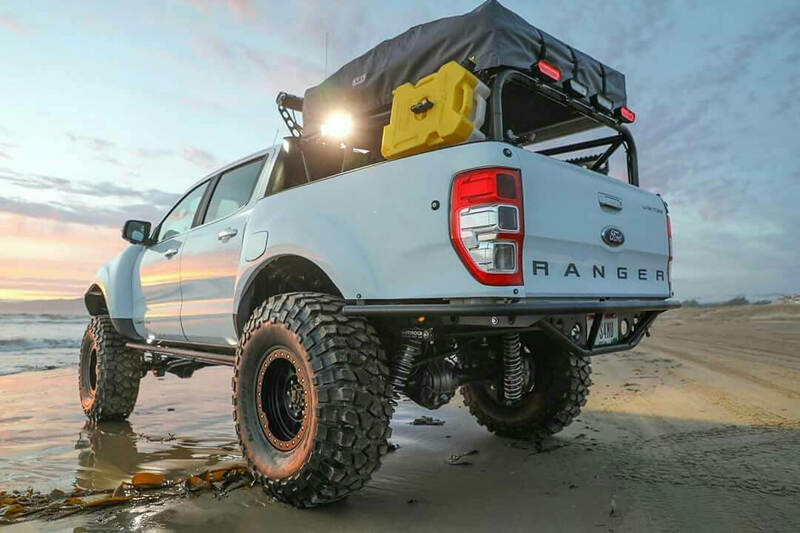 The front bar not only gives the Ranger its aggressive profile, but also hides a Warn Zeon winch behind its alloy skid plate. 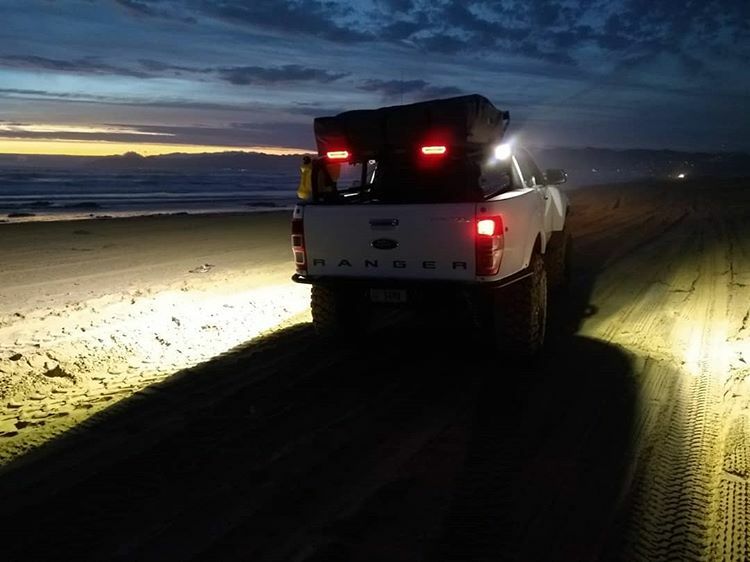 Tucked above the bar is one of the most high-tech light bars on the market, the 30-inch Rigid Industries Adapt – as the Ranger picks up speed the LEDs transitions from wide pattern to a spot beam, with eight selectable patterns through the in-car controller. 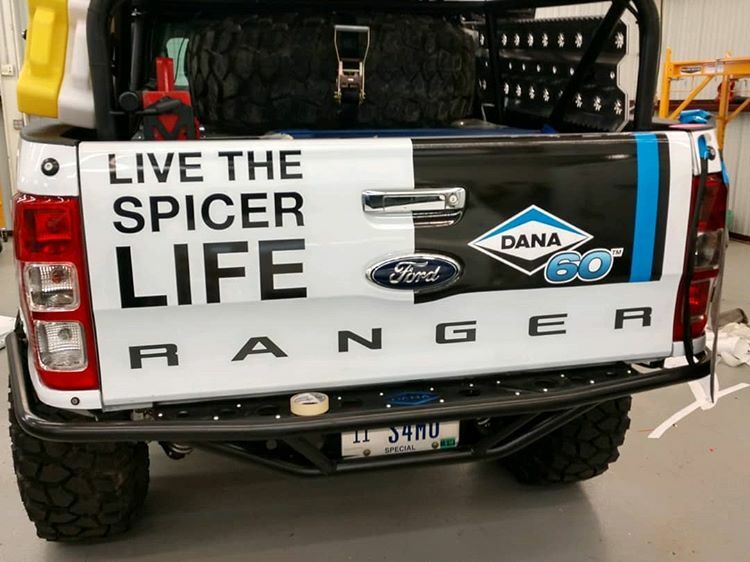 The side of the truck is protected by a set of custom rock sliders. 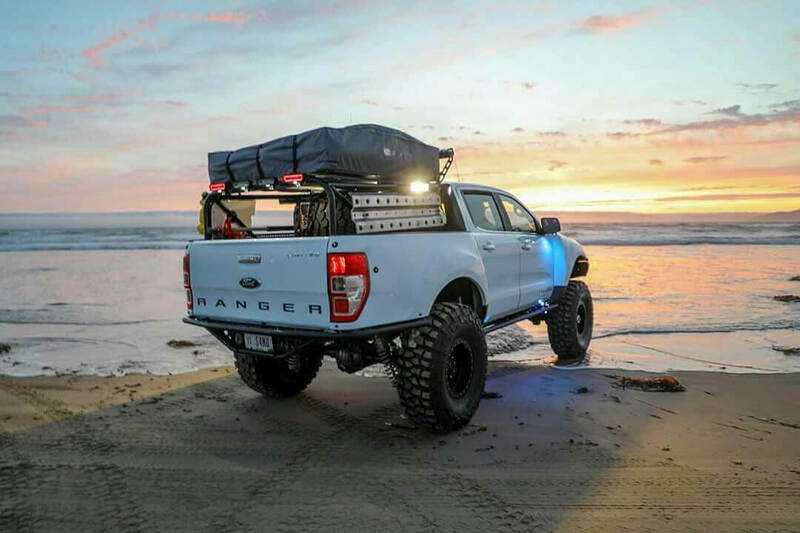 A custom bed cage was built to hold an ARB roof top tent, as well as a 39-inch spare tire, ARB 12V fridge, Hi-Lift, Jack and James Way Off-Road floor jack, AlumiTrack recovery boards, and modular RotopaX fuel storage. 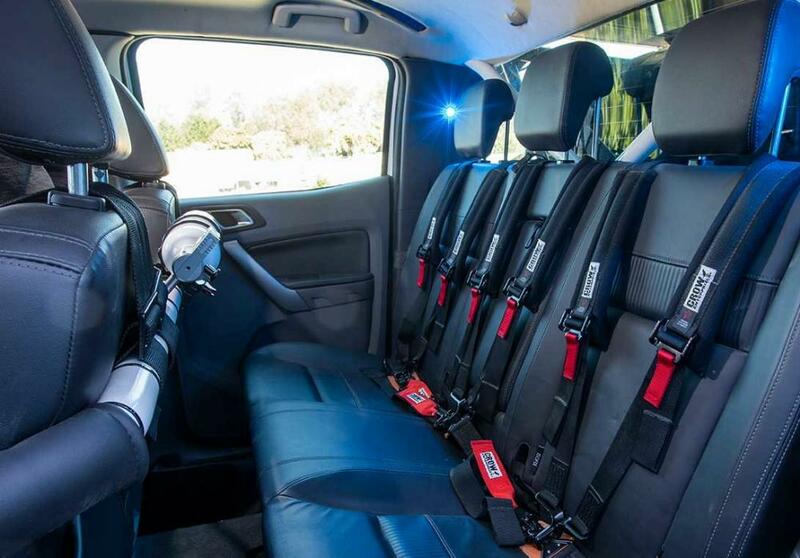 The full interior cage was installed to maximize the safety of the crew during the offroad adventures. Steel tubes were nicely fitted along with the original interior, which allowed to maintain comfortable conditions for the drive and the passengers. Sport seats and 4-point Crow Harnesses are installed on the front and the back. 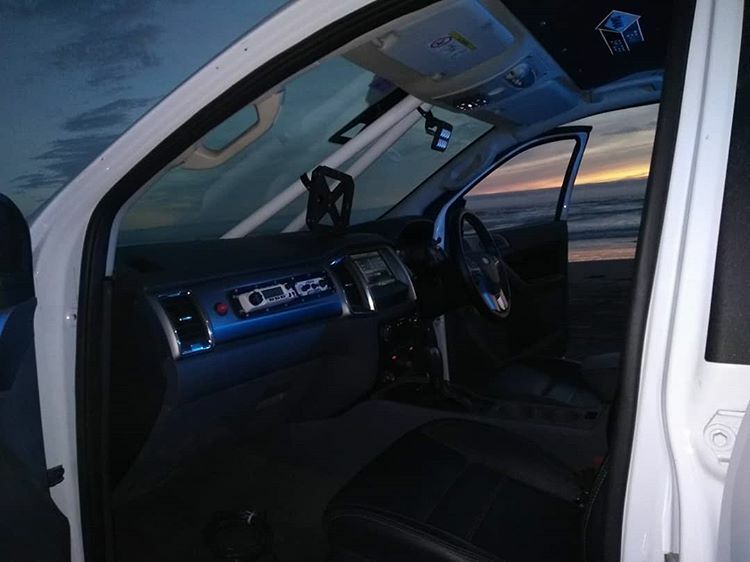 Among other enhancements are iPad GPS mount intercoms, race radios from Rugged radios, SPOD switch panel and built-in 2-pound fire extinguisher from SafeCraft.